Hello, so I have a great review for you today. I was kindly sent some insoles and socks from the guys at Sole. I have fairly collapsed arches (though now actually less so after making efforts to strength them over the past year – an exciting and thrilling process…not). So I’m not completely flat-footed anymore but I still don’t have very high or strong arches. Towards the end of a run or race I imagine my arches collapse further and this can cause me all sorts of biometric issues further up my legs and body. I’ve previously worn insoles to help support my arches and I wear supportive shoes to help as well. So I was very intrigued when I heard about Softec Reponse Footbeds. They’re a 1.6mm layer of cushioning that you replace your regular trainer soles with. The cool thing about them is that they’re moulded so provide a more custom support. They’re mouldable because they have an orthopaedic base layer which adapts to your foot without compromising that orthopaedic shape. You mould them by heating them in oven prior to putting them into your trainers… Sounds bizarre right? The insoles come with really easy instructions. First I trimmed down the insoles to fit into a pair of my trainers. I used the regular insoles as a guide to make sure they fit nice and snugly into the trainers. Then I removed them from the trainers and popped them into the oven for 3 minutes (I set an alarm as knowing me I’d have completely forgotten about them otherwise). There’s a sensor on the side of the insoles which turns from white to black when they’re ready which is very handy. You then have to put the insoles quickly into your trainers (let them cool just slightly!) as you need to put the trainers on and stand in them as quickly as possible to maximise the moulding effect. I won’t lie, I felt panicked and rushed to do this as speedily as possible, though it could be because I’m quite neurotic. Anyway I got my feet into them fairly quickly. Ahhh lovely and warm trainers. You then stand there for two minutes to let the magic happen. Then it’s complete! Thought? OK obviously right now I can’t run… but I’ve been doing lots of walking in these bad boys. They’re very comfortable. I feel well supported and not crowded or restricted in movement. I like that my foot fits nicely on them after the moulding because it means my foot isn’t rigidly forced into a position it’s not used to or not natural for it. Yes the soles provide support, but by supporting and working with my natural foot shape, rather than against it. I’m really excited to wear these for running. It was about time I got some new insoles so these are perfect. I was also sent a pair of their lightweight sport socks. 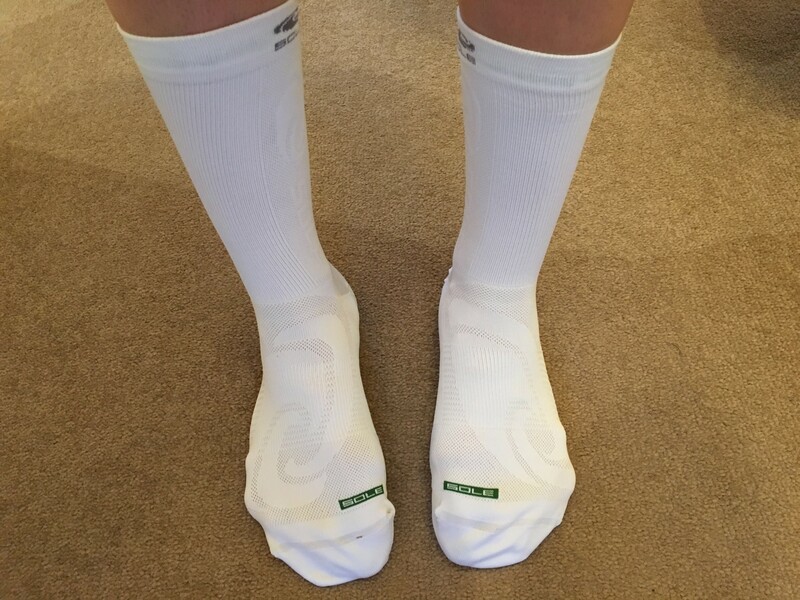 They’re a great all-rounder sock with breathable mesh panels and moisture control. Thoughts? They’re too long to wear when I go running or to the gym (unless I wear leggings) but they are PERFECT for wearing with wellies (rain boots for international readers). I struggle to find decent wellie socks that don’t slip down and there is nothing more annoying than having to ferret about inside your wellie to put up your socks. They stick to my ankles and calves perfectly and they’re so soft and comfy. I also love them in my walking boots. What type of trainers do you wear? Supportive, cushioned, neutral etc.? What socks do you prefer? Long, short, compression…?